I’ve answered some frequently asked questions in my last blog post already, but of course there are other questions that keep returning. Many of them are related to GNS3, a graphical network emulator using Cisco IOS images. I’m going to explain how to best set up GNS3 in a Windows environment, as that is what most people do. Linux should give better results, but I’m still researching that. GNS3 does not provide IOS images. There’s also no legal way to use IOS images in GNS3, apart from perhaps making a service contract with Cisco. So you’ll have to find the best way to use them yourself. Try to get a 37xx or 36xx IOS, because these seem to be the most stable in GNS3. Most people start with 26xx IOSes because they are most familiar with these, but they’re actually the least stable ones, so try to avoid them. Of course, the more advanced the IOS the more you’ll be able to do with it. After installing GNS3, go to ‘Edit’, then ‘IOS images and hypervisors’. There you can import the IOSes you have. Also, try to give them the memory they need, but not more, it will not be used (especially not in a lab environment) and will take more resources from your host computer. Next, go to the tap ‘External hypervisors’ in the ‘IOS images and hypervisors’ screen. Here, leave the ‘host’ field on 127.0.0.1, choose a port, UDP and console. The default settings should be okay: +5000 for port, +10000 for UDP, +2000 for console. Also, choose a working directory, which is a personal preference. Click ‘save’ just as many times as you have threads on your CPU(s): this will allow some multithreading for GNS3, which will improve performance on a multicore system. So if you have a dual core CPU with hyperthreading for a total of four threads, make sure four instances are created. Next, in ‘Preferences’, under ‘Dynamips’, check the ‘Enable ghost IOS feature’, as this will reduce resources needed. GNS3 will now run multiple copies of the same IOS image. Note that in a rare case, in some topologies, I have noticed instabilities here, especially when using different memory on routers using the same IOS image (which is not needed anyway). Beneath this there’s ‘Enable sparse memory feature’. Enabling it will cause GNS3 to use a paging file more aggressively, slowing down performance. If you have enough RAM, disable it. Additionally, take your time to look through the other options as well: you can link to Wireshark, allowing you to capture on any interface, specify a capture directory, and do the same for console software. Now one of the most important things: start up one router with an image you will be using, and after it booted, right-clock on it, and choose ‘Calculate Idle-PC’. Then choose a value from the list, preferably one with * in front of it. This will make the emulator not calculate idle cycles of the emulated image, greatly reducing CPU stress. And finally: never start all routers at once with the big ‘Play’ button on top. Start them one by one, and open a console after starting each one and check if you can get the basic prompt, ‘R1>_’. This takes a bit longer, but you can boot significantly more routers before everything becomes unstable. So this way, if done properly, you can get bigger topologies running. This is a basic configuration post, in the future, I hope to explain how to get more stuff running in GNS3, and how to distribute it between different computers. 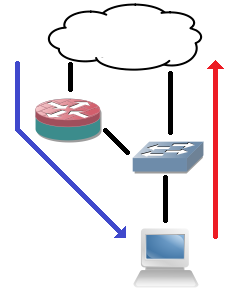 Virtual switching – A short introduction. The blue parts are done in software, only the last part, the pNIC, is physical. There are three big players in the hypervisor market: Citrix with XenServer, Microsoft with Hyper-V and VMware with ESXi or vSphere. Each has their own implementation of a virtual switch. Apart from that, Cisco has a Nexus 1000 virtual switch. I have no experience with XenServer and so far I’ve found litte information on it. A virtual switch that can be used is Open vSwitch, an open source product which runs on Xen and Virtualbox. I’m not sure if this is the only virtual switch that XenServer supports. Open vSwitch supports a variety of features you would expect from a switch: trunking, 802.1q VLAN tags, link aggregation (LACP), tunneling protocols, SwitchPort ANalyser (SPAN), IPv6, basic QoS. I could not find anything in regard to Spanning Tree Protocol support, so I’m uncertain what will happen if a loop is created to a server with multiple pNICs and no link aggregation configured. Again, I have little real world experience with Hyper-V, and details are not clear, but the virtual switch supports the mandatory 802.1q VLAN tags and trunking. Advanced spanning-tree support is missing as far as I can tell, you can’t manipulate it. I’ve found no information on link aggregation support. It’s a very simple switch compared to the other products. There’s one advantage though: you can run the Routing and Remote Access role on the Windows Server and do layer 3 routing for the VMs, which offers some possibilities for NAT and separate subnets without the need of a separate router. It’s a shame Microsoft decided to no longer support OSPF on their Windows Server 2008, as this might have been a great addition to it, making a vRouter possible. RIPv2 should still work. The vSwitch developed by VMware is, in my opinion, very good for basic deployment. It supports 802.1q VLAN tags and trunking. It does not support spanning-tree but incoming spanning-tree frames are discarded instead of forwarded. Any frames entering through the pNICs that have the source MAC of one of the virtual machines are dropped. Broadcasts are sent out through only one pNIC. These mechanisms prevent loops from forming in the network. Link aggregation is present but only a static EtherChannel can be formed, which requires some additional planning. QoS is not supported, and no layer 3 functions either. I’m adding the NX1000V to this list, as it is currently one of the few products on the market that can be used as a vSwitch instead of the default hypervisor vSwitch. Currently there’s only support for vSphere, but Cisco announced that there will be support for the Windows Server 8, too. The NX1000V is supposed to support anything that’s possible with a physical Nexus switch. So compared to the default vSwitch used, it will add support for LACP, QoS, Private VLANs, access control lists, SNMP, SPAN, and so on. With the ongoing virtualisation of data centers, virtual switching is an emerging market. For those of you interested in it, it’s worth looking into. VLAN limit and the VXLAN proposal. Today I stumbled across a nice RFC draft which proposes a new kind of network topology in data centers (thanks to Omar Sultan for the link on his blog). It’s four days old (at the time of writing) and is proposed by some mayor players in the data center market: it mentions Cisco, Red Hat, Citrix and VMware among others. It proposes the use of VXLANs, or Virtual eXtensible Local Area Networks, which is basically a tunneling method to transport frames over an existing Layer 3 network. Personally, after reading through it, the first thing that came to mind was that this was another way to solve the large layer 2 domain problem that exists in data centers, in direct competition with TRILL, Cisco’s FabricPath, Juniper’s QFabric, and some other (mostly immature) protocols. But then I realised it is so much more than that. It comes with 24 identifier bits instead of the 12 bits used with VLANs: an upgrade from 4,096 VLANs to 16.7 million VXLANs. Aside from this it also solves another problem: switch CAM tables would no longer need to keep track of all virtual MAC addresses used by VMs, but only the endpoints, which at first sight seem to be the physical servers only (I don’t think this is a big problem already. The draft claims ‘hundreds of VMs on a physical server’, which I find hard to believe, but with the increase of RAM and cores on servers this may become reality soon in every average data center). It also seems to have efficient mechanisms proposed for Layer 2 to Layer 3 address mapping and multicast traffic. Since it creates a Layer 2 tunnel, it would allow for different Layer 3 protocols as well. Yet I still see some unsolved problems. What about QoS? Different VMs may need different QoS classifications. I also noticed the use of UDP, which I understand because this does not have the overhead of TCP, but I don’t feel comfortable sending important data on a best-effort basis. There is also no explanation what impact it will have on link MTU, though this is only a minor issue.